Irritated skin can be a nuisance. But for people with allergies and/or sensitive skin, it’s a constant reality. Not only that but, when it affects your face, it can be hard to find hypoallergenic makeup that doesn’t irritate it even further. So, what can you do if you have sensitive skin on your face, especially around your eye area? Your eyes are one of the most sensitive parts of your face, and any irritation can leave them red, watery, and itchy. It’s not a great look to start your night out. Well, thankfully, there are a few options for sensitive eyes at your disposal. Read on! If you’re battling irritated, sensitive skin, hypoallergenic makeup might be a good option. But it’s important to take the term hypoallergenic makeup with a grain of salt. However, there are good companies out there trying to help people with allergies and sensitive skin, so hypoallergenic makeup is still a good place to start. Unfortunately, it will mean your own “trial and error” testing with a potentially expensive eye makeup product to see if your skin likes it or not. Seek out recommendations from friends, or see what other people are saying about their experiences online. It’s also a good idea to familiarize yourself with ingredients. This might help you determine what’s triggering your allergies. Get to know what some of the most irritating ingredients on the market are, and carefully read those labels. You should also look at some of the habits you keep when it comes to using eye makeup. You may be surprised at how some of these habits affect sensitive eyes. This tip is really for everyone – sensitive eyes or not. Makeup brushes accumulate skin cells, oil, dirt, and dust, and they are a breeding ground for bacteria – not exactly the kinds of things you want to brush back onto your skin, let alone around sensitive eyes. Dirty brushes are also much harsher on your skin, as they lose their softness once they become clogged with weeks of product and debris. You should aim to clean all of your makeup brushes at least once a month. Clean the brushes you use around your eyes at least twice a month. Fill a bowl with warm water, add some shampoo or dish detergent, and swirl the brushes around to remove the buildup. You may need to use your fingers to help massage the dirt out. Then, give your brushes plenty of time to dry before you use them again. Mascara and liquid eyeliner should be replaced around every three months, while pencil eyeliner can be kept up to a year. 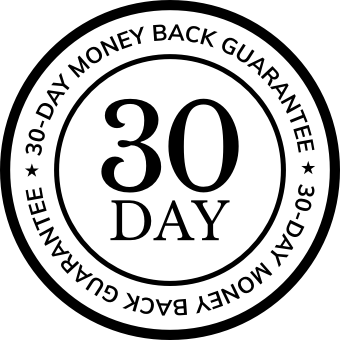 Think of it as an excuse to try out a new product every few months! 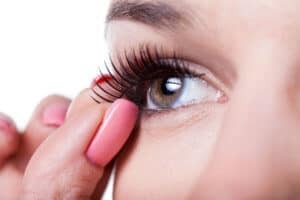 Speaking of mascara, it’s not just bacteria that you need to think about when it comes to sensitive eyes. Unfortunately, some of the most tech-forward mascaras on the market may not be ideal for sensitive eyes. Mascaras on the market today promise to deliver the longest, thickest lashes. And many of the newer formulations use tiny little fibers that bond to your natural lashes to accomplish this goal. But unfortunately, these fibers can get into your eyes – causing irritation. 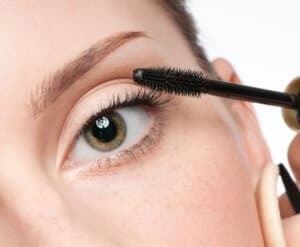 Try to just brush just the tips of your lashes with mascara if you’re struggling with itchy mascara eyes. This will still give you length, but it will keep the product further away from your eyes. Try out a “mascara base” product which can help mascara to flake less and stay put. When you pull the wand from the tube, use a tissue to pat off the excess product so it doesn’t get into your eyes. Consider tinting your lashes for a long-lasting “mascara look” – or invest in some mascara-and-glue-free magnetic false lashes (see below). Some people love to line their inner eye line, or waterline, with either white liner (to brighten the eyes) or dark liner (for a more sultry look). Though this can look great, it’s a big no-no for sensitive eyes. Because this area is damp, the liner can easily run into your eyes, leaving them red and irritated.3 Stick to using eyeliner only outside your eyes. Today, eyeliner comes in so many variations – liquid, gel, pencil, and crayon. Some of these will irritate your eyes more than others, but you’ll need to find what works best on your own individual eyes. Some people find a liquid liner more gentle and smooth, while others swear by a good old-fashioned pencil. Experiment a bit, and see what gives you the least grief. Though false lashes don’t constitute makeup per se, they can definitely be an irritant for some people. You’ll want to choose “falsies” made from synthetic fibers rather than natural animal or human hair. This is because these natural hairs are more likely to irritate the eyes or cause an allergic reaction. Speaking of irritants, the glue used in false lashes can very easily aggravate the eye area. Not to mention that you’re putting toxic glue near your eyes! Your best bet – seek out false lashes that utilize the power of tiny magnets. 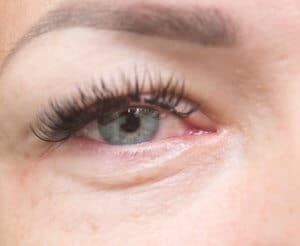 If you suffer from sensitive eyes, try some of these potential solutions, and see if your makeup application becomes more bearable. Good department or cosmetics stores frequently offer free samples of products – and this is a great way to try something out and see if you react. Or you could grab a free make-up test at the counter with a product. Just remember to not put all your faith in hypoallergenic makeup, because not all hypoallergenic makeup is going to be friendly to your allergies. Ultimately, only your skin can tell you what it likes.